This week has been all about production. 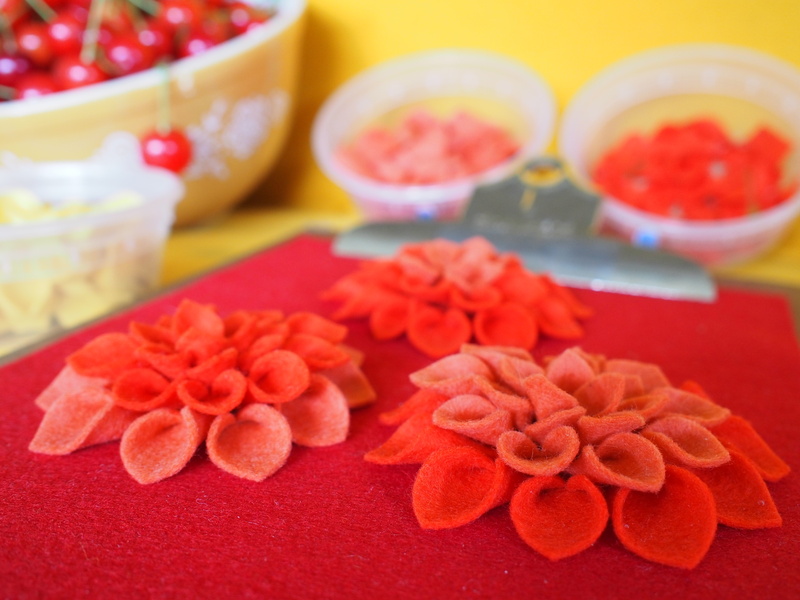 Primarily making more felt dahlias. I had previously had a few dahlias made up and placed on a super cool log that I had found while mushroom hunting last fall. Unfortunately, while I was letting the piece sit, the little critters that were sleeping in the log woke up. I was inspecting it the other day and noticed the little bugs walking around the flowers that I had made. This week I have been redesigning the final piece, making flowers and letting the bugs out so that they can live a more productive life in the great outdoors. I also got out side this weekend to enjoy a little sun. I spent a good chunk of my Saturday picking pie cherries and snacking on golden raspberries and service berries at my friends urban homestead. I am still trying to get used to my new schedule. Time management is going to be key. It is amazing to think that in my previous position I was working 50 – 70 hours a week and still making things after work. How did I do it? Starting something new is always hard in the beginning. It takes time and patience to figure things out. Besides, I don’t have all day to make things every week. (that last part was a reminder for myself). Other than that life is good. The weather is warming up and I have a ton of ideas filling up my notebook. Those are gorgeous flowers! Can’t wait to see the new projects you start!